The Simi Valley monitoring station is located on the campus of Simi Valley High School. The address is: 5400 Cochran Street, Simi Valley, CA 93063. This site has real-time monitoring for ozone, pm2.5, and pm10. AirNow shows real time data for Particles (PM 2.5) and Ozone. You can also find archived data. 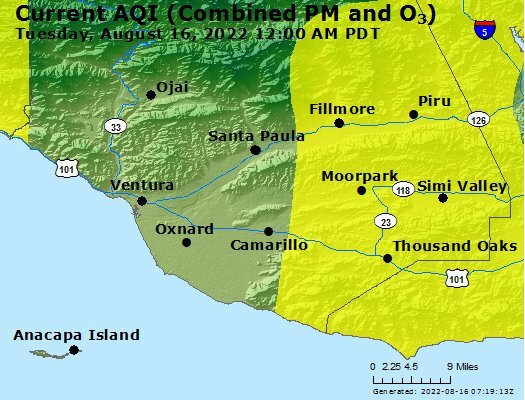 With its animation of air quality maps the AirNow website is our recommended site for the public to look up real time data for the Simi Valley region of Ventura County. Station Info (ARB) links to the California Air Resources Board website. This webpage shows specific site information including photographs. In addition, raw and detailed air quality and weather information can be found here. Weather Conditions (NOAA) shows the most recent hour and the past twelve hours of weather observations. Historical weather data and other detailed information is also available at this site.